Century Business Solutions Certified by Acumatica, EBizCharge is a payment application designed to make the processing of electronic payments more efficient and cost-effective. EBizCharge is PCI compliant and utilizes the latest data tokenization technology to provide the highest level of security. Additionally, the integration has been specifically developed to eliminate unnecessary double data entry and reduce human errors by automatically posting received payments to account receivable and general ledgers. It’s not just document management. It’s behind-the-scene empowerment. No matter its source. No matter where it’s going. No matter what you need or want it to do. UnForm will find, enhance and deliver your information with speed and precision. B2BGateway’s Acumatica solution is 100% built and maintained by B2BGateway developers. B2BGateway’s solution is integrated directly into the Acumatica users dashboard, allowing for hassle free, reliable and seamless exchange of any business documents such as purchase orders, invoices, inventory updates, advanced shipping notices via any communication method (FTP, AS2, HTTP, API) and any file type (X12, EDIFACT, CSV, etc). B2BGateway’s EDI solutions for Acumatica are simple to use, competitively priced, highly effective and can increase profitability by reducing the costs associated with manual data entry errors. JAAS Advanced Manufacturing Software (JAMS) offers specialized software for manufacturing companies, specifically for the discrete manufacturing industry. JAMS is built utilizing the Acumatica Cloud xRP platform and takes complete advantage of the platform. Integrating seamlessly with Acumatica’s Financial Management, Distribution Management, Customer Management, and Project Accounting Suites; JAMS provides real-time coordination of all your business activities from one central location. JAAS Systems has also created two additional modules that can be utilized in conjunction with JAMS – Estimating and Product Configurator. The Estimating solution creates estimates for new or existing items that can be converted into bills of material, production orders, and/or another estimate. All aspects of estimating are taken into account, including materials, overhead, labor, and other miscellaneous costs. The Product Configurator is a muti-level, dimensional, rules-based system with non-hierarchical feature selections and configuration evaluation. The Product Configurator from JAAS Systems allows the user to configure a product’s features, options, and dimensions to maximize the quote-to-order process. The Kensium Magento Connector is a key feature of Acumatica Commerce Edition. It combines the power of Acumatica Cloud ERP with the world’s leading eCommerce platform, Magento. This extension tightly integrates the two platforms through two-way data synchronization, eliminating redundant information and the need for duplicate entries. The Magento Connector transforms Acumatica into a single business management platform from which merchants can manage all eCommerce activities, including those related to inventory, fulfillment, orders, sales, and financials. It provides automation and synchronization that allow Magento businesses to maximize operational efficiency and boost profits. An essential component included in Acumatica Commerce Edition, Kensium Product Configurator enables you to configure, bundle, and group products. It also gives you the option to offer downloadable and virtual products through Acumatica. These products are available on your sales and purchase order screens, allowing sales personnel to easily create orders. Product Configurator enables you to manage the following types of products. Fusion Retail Management System (FusionRMS) is a suite of applications extending the reach of Acumatica to the small and medium-size retail and wholesale distribution markets. Seamlessly integrated, these applications simplify end-user experience and extend the reach of Acumatica without affecting core functionality. Spitfire Project Management System combines the collaborative strength of web-based project management with deep integration with Acumatica Cloud ERP for project cost accounting and financial management. Spitfire’s browser-based project management has Owners/Developers, Project Managers, Consultants, Engineers, General Contractors and Subcontractors collaborating with ease and efficiency in the new mobile world – Anytime, Anywhere, on Any Device. For most businesses, the accounts payable process can be a nightmare. Automating this process saves you time, money and effort. With AvidXchange, you can slash the time you spend on invoice approvals and payments by 60% or more – and significantly reduce your operating costs too. Plus, this cloud-based, fully integrated AP and Payment Automation solution for Acumatica users eliminates your need for manual data entry and all the headaches that come along with it. Uplevl offers Acumatica customers a variety of ways to digitize their AP-related documents and the processes surrounding them. Acumatica users and their vendors can upload, scan, email or fax in their invoices or other documents to Uplevl. Uplevl automatically indexes all the content on each page and pulls key information into data fields, minimizing manual data entry, and making it easy to find documents later. Once an invoice has gone through the appropriate approval process, it is sent to Acumatica via our API integration for the remainder of the payment process. A link is automatically added to the AP bill in Acumatica, making it simple for Acumatica users to view the invoice when working in Acumatica. A history of every action taken on a document is automatically logged, creating an audit trail that is readily accessible. Uplevl also extends beyond AP to provide businesses a solution for all of their document management and processing –including contract management, human resource management, technical documentation, and collaborative writing. InfinityHR is a secure web-based HR Management System that provides comprehensive HR and payroll functionality to a diverse client base. The system architecture consists of three portals (enterprise, administrative, employee) that allow for tailored module offerings to clients with varying requirements. The highly configurable employee self-service portal serves as the central hub for all relevant HR data and activity while also streamlining interactions between employees, managers, and administrators. InfinityHR has various established integrations with third-party vendors and outside technology platforms and boasts a robust reporting suite that includes ACA compliance, 200+ standard reports, a customer report writer, and electronic delivery of benefit data to carriers. EazyStock is an Acumatica certified application that brings true inventory control to companies carrying stock. EazyStock helps wholesalers, manufacturers, and distributors become more competitive by automating and optimizing their inventory management processes. The cloud solution is easy to implement and customers are quickly achieving inventory cost savings of 25-50% whilst also improving product availability and fill-rates. EazyStock is developed by Syncron, a leading provider of inventory management solutions, trusted by leading global brands in 100+ countries around the world. NonProfitPlus enhances the cloud ERP experience for nonprofits, providing the unique functionality required to run a successful not-for-profit organization. NonProfitPlus empowers organizations through effective financial management, offering a suite of modules that is tightly integrated with Acumatica Financial Suite, Time and Expense, Fixed Assets, and the Distribution Suite. The Acumatica Nonprofit Accounting Suite enables your organization to demonstrate accountability and stewardship, maintain funding sources, and engage leadership by analyzing your true financial picture. 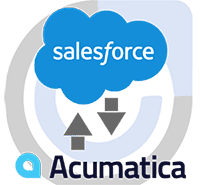 Implementing Commercient SYNC creates a simple data integration pathway between Acumatica and Salesforce. Our SYNC solution also enables you to prevent the duplication of data, handle custom objects in Salesforce, and take advantage of the premier support offered by our qualified specialists. Our goal is to provide a smooth data integration service that results in simplified business processes for you and your sales reps. Commercient SYNC for Acumatica ERP and Salesforce CRM is designed to make the most of what these two systems have to offer. We believe that when all of your data is in one easy to access place, it’s possible to accomplish almost any business goal, big or small. Edisoft Merchant Cloud Services is an out-of-the-box, SaaS supply chain platform for manufacturers and distributors, available on any mobile device, anywhere in the world. The modular software platform supports flexible communication options for EDI, and seamlessly integrates with Acumatica’s web services API to automate EDI order posting, shipping, and invoicing processes. It also simplifies warehouse operations by eliminating a range of pick and pack tasks, and includes support for global transport carriers. Acumatica manufacturers and distributors can take advantage of Edisoft’s platform to achieve a declining average EDI cost curve and a declining operational cost curve as order volumes and number of customers increase. StarShip by V-Technologies is a multi-carrier shipping software that provides small package and LTL processing to automate shipping labels, email notifications, EDI transactions, and more. Eliminate the manual workflows of cutting and pasting shipping and commodity information to websites or stand-alone systems and ultimately save time creating shipping labels and related documents such as packing slips, commercial invoices, and bills of lading. StarShip benefits extend past the warehouse with custom shipment notifications and labels that build your brand and encourage repeat business, automated freight calculation for faster invoicing, and a dashboard that gives everyone in the office access to shipment details, metrics, and reports. RIC Group supply chain suite for Acumatica is the only choice for a growing small to mid-sized business, which includes warehouse management solutions, transportation solutions and EDI (electronic data interchange). Our solutions are feature rich and allow flexibility and scalability without modifications. The RIC Groups warehouse management system fully integrates to Acumatica. With the combination of Acumatica and The RIC Groups WMS, users will dramatically improve accuracy, process orders faster and improve customer satisfaction. AcuCharge guarantees the lowest merchant credit card processing rates through Level 3 credit card processing, which is obtained by transmitting detailed transaction data to banks. The plug-in, the only Level 3 Interchange solution for Acumatica, can be used with multiple payment gateways and card types. Kensium Solutions, a former Acumatica Innovation Partner of the Year, co-developed AcuCharge and delivers responsive, effective support services for the solution. PrintShop manages all of your print and embroidery jobs for the promotional products and apparel industries. With PrintShop, we can process your print jobs from quotation to print production, handle all daily inventory management, shipping, and job setup screens/data. PrintShop is integrated with your CRM, Accounts Payable and Receivable all across the job. PrintShop links your core business processes – from sales and marketing, artwork and design management, inventory and purchases, fulfillment and shipping, ecommerce order management and finance. Smartsheet is a modern SaaS visual project scheduling tool for tasks and resources that’s integrated with Acumatica Project Accounting to make any project professional’s job easier. Field supervisors and project managers can use Smartsheet to reschedule tasks and resources quickly and easily. Schedule changes are sent back to Acumatica to update Project Accounting. Users who perform back-office business processes such as project costing, purchasing, and expense processing can do so in Acumatica. Manage and sign documents easily and rapidly with Adobe Sign for Acumatica. Adobe Sign for Acumatica makes it easy for Acumatica users to prepare, manage and send documents for signing. With this integration in Acumatica, users can now take advantage of the Adobe Sign capability from within Acumatica Cloud ERP. Whether working on a sales order, bill or contract, users can now send these documents for signing quickly and easily, straight from Acumatica. Contract Management (part of the Advanced Revenue Suite) from MaxQ gives you the flexibility and control you need to effectively manage contract life cycles with one single point of data entry. Streamlined contract management features enable quick and easy setup of customer billing cycles, revenue recognition cycles, and renewal processes. Amazon Order and Inventory Sync Management Software with Multi-Channel Fulfillment: Omni Channel Hub is a product that is designed for multi-channel retailers who are dissatisfied with their current supply chain management software. Omni Channel Hub is a specialized retail platform that lets your business access a range of marketing channels like Amazon and eBay and helps maintain, analyze, and optimize operations across each of those marketplaces. InvoiceAction will automate most of the mundane and tedious tasks involved in posting supplier invoices. InvoiceAction will capture invoices as they are received through email or fax or when they are scanned and automatically sort, separate and process them into Acumatica. InvoiceAction eliminates manual data entry, automates validation against Vendor Master File, Purchase Order and Receipt tables, allows for automated GL coding, electronic approvals and automatic posting to Acumatica. BigCommerce Connector delivers seamless integration between e-commerce stores and Acumatica. Those that implement it into their business strategy enjoy synchronization between the two platforms, meaning the information you input into one platform will be updated in the other. Use of BigCommerce Connector allows businesses to take and carry out orders, manage inventory, set prices, and process inbound logistics all in Acumatica, creating an omnichannel approach. The benefits of BigCommerce Connector lead to greater profits and increased conversion rates for e-commerce businesses. CADTalk for Acumatica is a CAD integration tool that eliminates the manual transfer of data from CAD software into Acumatica. This eliminates redundancy, cuts lead to production, and reduces BOM errors. CADTalk will allow for the creation of new items and full BOM information if not already existing in Acumatica, or allow users to update, revise, or manipulate existing information. Very often companies can implement the basics and get a big benefit within hours! What makes CADTalk a Unique CAD Integration is our deep understanding of ERP and its implementation, as well as the challenges of engineer-to-order companies. We have forged great partnerships with all of the major CAD/PDM vendors as well as the ERP vendors that are known for innovation. Our goal is to provide the very best CAD integration experience on the planet. To do that, we provide deep and robust integrations that can be configured for the customer’s needs instead of custom software that is hard to maintain and costly for the customer. CirrusPrint is designed to manage and streamline printing and document delivery across networks. It solves cloud migration problems related to printing, improving performance, simplifying configuration and maintenance, and securing documents as they are sent across the Internet. It also provides the most direct and immediate method to deliver documents to your users. CirrusPrint runs on Windows and Linux, in the cloud or your own data center. It accepts print jobs and other documents, parses and compresses them, and delivers them to remote printers, file systems or users. Integration with applications is simple and flexible: print to it like any network printer, email files to it, drop files into it, send PDF files from your browser, or use the REST API. Print jobs sent through CirrusPrint arrive quickly and securely at remote printers, as precise duplicates of the original print job. Documents can also be sent directly to users, bypassing the clutter and overhead of email. Files dropped on the server can land at remote locations automatically. You can email PDFs files to your printers. Each of these delivery mechanisms takes advantage of CirrusPrint’s patented compression and easy configuration and management. Acumatica users can send PDF files directly from their browser to any configured device, or set up scheduled reports and templates to email printers or file systems, enabling unattended printing and document distribution tasks. IIG’s Acuboost “Container Tracking” powered by Acumatica allows companies to view inventory in transit by allowing users to create container information tracking transactions. Items in transit can be easily loaded from existing purchase orders into container transactions created by selecting an entire purchase orders, specific lines of a purchase order, or partial quantity of a purchase order line. Users are able to track the container status using user defined container status codes such as; on the water, customs, in land transit, foreign dock. In addition, this enhancement allows for tracking of the expected and actual departure & arrival dates, payment due date as well as custom & duty information. The landed costs info is entered at the container level and are allocated to each item in the container. Landed Costs are loaded into created Receipts of Goods transactions for the container. DealerSoft is a new generation of dealership software and back-office business systems designed to take your dealership into the Internet age. DealerSoft runs inside of Acumatica ERP and is natively built as an embedded Acumatica module. With DealerSoft, you receive an advanced suite of software that connects customers, equipment suppliers, and your dealership operations. Powerful. Reporting. Simplified. At DexSplicity, we share our belief in getting quality information into the hands of those who need it by providing a reporting tool that is EASY to use and can access ANY data. DexSplicity is an Excel Add-in that combines drag and drop report design with one-click data refresh in reports that can include any formula, format or graph available with Excel features. Webiplex DocuPeak: Automatic, intelligent, document capture and automation apps letting you focus on what really matters. Robotic Process Apps built on the DocuPeak cloud platform streamline operations “before and including data entry”, from automated data extraction and data entry, to approval workflows and document lifecycle management and even entirely electronic form applications. DocuPeak apps, whether out-of-the-box or custom, are tailored to your unique business requirements, using your unique terminology and processes, and leveraging your unique ERP customizations. Manage and sign documents easily and rapidly with DocuSign for Acumatica. DocuSign for Acumatica Cloud ERP makes it easy for Acumatica users to prepare, manage and send documents for signing. With this integration to Acumatica, users can now take advantage of the DocuSign capability from within Acumatica ERP. Whether working on a sales order, bill or contract, users can now send these documents for signing within Acumatica Cloud ERP. Ebay Inventory and Order Management Software – Sync Products to Marketplaces: Omni Channel Hub is a product that is designed for multi-channel retailers who are dissatisfied with their current supply chain management software. Omni Channel Hub is a specialized retail platform that lets your business access a range of marketing channels like Amazon and eBay and helps maintain, analyze, and optimize operations across each of those marketplaces. Import, manage, and ship your orders with ShipStation, the #1 choice of online sellers. With ShipStation, ecommerce shipping is easy – you’ll be up and running in minutes – no installation or insanity involved. Our shipping solutions seamlessly integrate with all major shipping carriers, shopping carts, ecommerce marketplaces and more. Connect your selling channels to import your orders and create and batch print shipping labels with a few clicks. SPS Commerce is proud to roll out our Acumatica integrated EDI solution powered by MAPADOC. This Fulfillment (EDI) solution provides streamlined communication and efficiency across your trading partner network. To meet your needs, SPS offers solutions to satisfy all EDI requirements and integrate seamlessly with your Acumatica ERP. DynaRent is a new generation of equipment rental software built for the Internet. It integrates rental, sales, service, asset management, job costing and accounting into a single system. DynaRent features are simple yet built to handle the complex situations that arise during a rental transaction: orders that start with a quote and later become a contract, returns coming back broken or missing, billing being either repetitive or one-time, warehouse parts sold along with your rental equipment, billing rates being dynamically altered when the rental period extends (such as daily rate going to monthly). Are you copying and pasting your data into Excel? Discover the BizNet Excel Suite, the most innovative and intuitive reporting solution on the market pre-built for Acumatica. It creates a user-friendly, drag and drop environment with real time access to the most accurate and current data. Built upon fundamental business disciplines and controls, BizNet solutions reduce the time spent updating spreadsheets and make it easy for Microsoft Excel users to connect, analyze, and share real time information. An EDI solution for Acumatica that is fully embedded by design. The eZCom EDI Connector for Acumatica delivers absolutely seamless communication with trading partners while maintaining all the customization, mobile, and automation features of Acumatica that you rely on. With the EDI Connector, an extension of Lingo, eZCom’s award-winning EDI application, Acumatica users have automatic, 100% transparent exchange of electronic documents such as sales orders, invoices, advanced ship notices (ASNs), inventory updates, purchase orders, and more. Essentially, they’ll be able to create, review, and process trading partner-compliant EDI documents just as if they were standard Acumatica objects. Costly chargebacks due to mistakes, time consuming manual and duplicate data entry, compliance concerns, retailer-specific validation checks, drop ship errors, and label printing problems can all be eliminated. In addition to comprehensive EDI functionality, Acumatica customers will save time, increasing trade volume and respond quickly to retailer and marketplace requirements. EDI that is Acumatica! Nuvola connects Concur’s expense data within Acumatica’s Cloud ERP to share data and automate processes. Nuvola’s Integration Platform as a Service (IPaaS) solution clearly maps business logic from Concur to Acumatica and removes guesswork to give a complete picture of your data workflows. Workflows can be easily modified to fit your needs. Our platform is designed with security in mind and is scalable to accommodate large data flows, so you can integrate with confidence. Nuvola streamlines repetitive processes so you can focus on your core business. From developers of Service Management for Acumatica, comes SkyKnack. First-class services for partners and members of the Acumatica community. We leverage our extensive knowledge of the Acumatica ERP and its framework to provide you with premium, cost-effective consulting and support services, from customizations, code development and reports design to assistance with implementations. The unity and ease of payments delivered by PayPal is unmatched. With all payments centralized, it’s easy to analyze outbound and inbound cash flows, as well as orders that are due in the future. PayPal works with nearly every merchant account, processor, and shopping cart, making it easy to integrate with Acumatica and existing website structure. Those who choose PayPal enjoy peace of mind, with their financial information safe and security from PayPal’s protection policy. Built around the Dyna-Cast™ forecasting engine, the module predicts next months’ sales using focused forecasting. The planning engine takes this forecast, looks at current inventory, and tells you what to buy and make. The benefits over traditional min/max and spreadsheet-dependent practices are immense: distributors can cut purchasing overhead; manufacturers can reduce planning and scheduling costs. IT Pro Global provides a well defined, structured and iterative path to migrate business data from QuickBooks to Acumatica. The tool helps migrate Master Records (such as Accounts, Customers, Vendors and Items) along with historical transactions such as Sales Orders, Purchase Orders, Invoices, Payments, Bills, Checks, Deposits, Journal etc. The system allows you to select the types of data that you want to migrate and is also designed to migrate all of transaction data or only a portion of the data based on dates. Rental360 enables companies who rent products as a portion of their main business as well as companies that primarily rent consumer goods and industrial equipment for construction, oil, gas, and pipeline projects. It provides complete 360 degree coverage of rental needs such as managing inventory, tracking depreciation, tying rental activity back to office systems, and more making it a perfect add-on to Acumatica deployments for companies who need to maximize their rental business efficiently. Paramount WorkPlace brings advanced web-based and mobile Requisition, Procurement, and Expense solutions for mid-market and enterprise organizations. Automate your Requisition and Expense, move projects forward, enhance communications, gain real-time visibility and control, and deliver strong ROI across your organization. Experience a software solution that is easy for employees, effective for management, and powerful for accounting. Achieve just about any spend management goal, eliminate paper-based processes, and provide excellent employee experience. For most businesses sales tax is an obligatory, complex nightmare. Automating this process saves time, money and effort. Avalara AvaTax dynamically delivers instantaneous sales tax decisions based on precise geo-location in more than 11,000 taxing jurisdictions. The system automatically considers hundreds of thousands of taxability rules and the latest jurisdiction boundaries to deliver the right rate and tax calculation, every time. AvaTax removes the guesswork by integrating seamlessly with existing business systems from ERP, financial, and billing systems to eCommerce shopping carts and Point of Sale systems. Rates are calculated “behind the scenes” and automatically applied to each transaction. As your business continues to grow, AvaTax is built to grow with you. This cloud based Software-as-a-Service (SaaS) is tailored to meet each customer’s specific needs and eliminates additional hardware costs. The Scanco integrated WMS solution for Acumatica introduces a new paradigm in integrated supply chain execution solutions – robust extended warehouse management functionality at an outstanding cost value for your operation. Specifically designed for Acumatica ERP users, Scanco’s WMS Solution delivers innovative product features, mobile solutions and an easy to use interface. Acumatica shipping by Pacejet seamlessly integrates hundreds of parcel, freight and 3PL shipping services directly into Acumatica to reduce cost, improve labor efficiency and increase fulfillment speed. Freight quotes with rate shopping, improved shipment billing and service controls, automatic capture of tracking numbers, and freight terms with cost+price capture are just a few of the features. Pacejet worked with Fusion Software to adapt Acumatica to handle dimensional information for standard packages as well as adding boxes on the fly – including dimensional requirements for shipping accurate quotes. The Pacejet integration can work with or without Fusion Software’s Warehouse Management Suite. However, Fusion adds pallet management, pack contents detail, scale integration, and handles multiple units of measure for picking and shipping, all embedded in Acumatica. Whether you choose FusionWMS and Pacejet, or Pacejet alone, the savings in time and labor well justify the investment. Shopify Connector delivers seamless integration between e-commerce stores and Acumatica. Those that implement it into their business strategy enjoy synchronization between the two platforms, meaning the information you input into one platform will be updated in the other. Use of Shopify Connector allows businesses to take and carry out orders, manage inventory, set prices, and process inbound logistics all in Acumatica, creating an omnichannel approach. The benefits of Shopify Connector lead to greater profits and increased conversion rates for e-commerce businesses. Online sales of auto parts and accessories will reach $6.5 billion in 2017 and will continue to grow at a 15% annual rate. Those that tried to reach and surpass $1M in revenue are finding it difficult to achieve without the right tools and features in their eCommerce solution. Here are the reasons why Shopping Cart Elite is the best choice for businesses selling auto parts and accessories: Shopping Cart Elite includes the most Automotive Data. With SCE, you get more brands than any other shopping card, free. Over 1,500 brands + SEMA data + JDM data comes with your package. For many businesses, not having this data included can be a deal-breaker because it affects time-to-market. Often it can take weeks or even months to set up automotive data feeds. It will also cost you development fees and resources if you have to do the set up manually. It is important to consider this if you don’t want to delay your sales when starting up. If you prefer not to deal with the hassle of development and want to have everything included from the start – go with Shopping Cart Elite. SourceDay is a Software as a Service (SaaS) solution that automates purchase order management processes by seamlessly integrating with Enterprise Resource Planning (ERP) systems. SourceDay extends ERP purchasing capabilities by centralizing and managing the PO lifecycle for buyers and suppliers to eliminate manual processes while improving supplier performance. SourceDay is targeted at manufacturing and distribution companies that use ERP systems to manage direct spend. By using SourceDay, customers can improve on-time supplier-provided material by 35% on average. TaxCloud for Acumatica automatically retrieves the latest sales tax rates from TaxCloud’s library of tax tables so your sales orders and invoices are always up-to-date. TaxCloud is free and easy to use. You can now calculate sales tax for every address in the US and automatically keep track of product and use-based exemptions in every state. TaxCloud is trusted by 15,000 online retailers of all sizes to automate their sales tax. Acumatica’s integration is seamless and easy to use. Simply enable your Taxcloud account in Acumatica and then enjoy the normal sales order and invoice process. TaxCloud for Acumatica will automatically maintain the correct sales tax for you, while transmitting all sales tax information and/or quarterly tax reports to your local municipality. AcuShip connects Acumatica to UPS Worldship® and helps companies who are utilizing both systems to dramatically increase efficiency by greatly reducing manual entry and potential for errors. By adding AcuShip to your existing Acumatica system you’ll gain automatic, two-way communication between your Acumatica software and WorldShip®. That means that you can initiate WorldShip® shipments right from inside Acumatica. AcuShip will also automatically import WorldShip® information into Acumatica such as weight, costs, and tracking numbers. When a warehouse management system is too much, Savant ADC provides small and mid-market companies with a scaled down version of Savant’s robust WMS solution. Unlike most automated data collection (ADC) solutions that have evolved from technology integrators with often little or no industry expertise, Savant ADC was developed by supply chain professionals who have worked with global distribution and manufacturing companies in the design and implementation of warehouse automation.